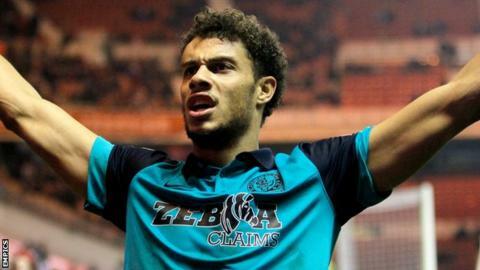 Blackburn Rovers manager Gary Bowyer has confirmed that there are clubs interested in striker Rudy Gestede. The 26-year-old joined from Cardiff for an undisclosed fee in January 2014 after a successful loan spell. The Benin international has scored regularly since the move, netting 24 goals in 45 appearances. "I think Hull City have shown interest. There isn't any official bid as I'm led to believe at this moment in time," Bowyer told BBC Radio Lancashire. "But I'm also led to believe that there are other clubs that are interested." The France-born forward came through the youth system at Metz but, despite being a France Under-21 international at the time, failed to break into the first team and spent a year on loan at Cannes. He moved to Cardiff in 2011 following a successful trial but made just 15 starts for the Wales club over two years, prior to his move to Blackburn. "I'm not being disrespectful to Rudy, but this time last year he announced his arrival with a header at Leeds," added Bowyer. "He's now on everybody's lips and rightly so. He's a fantastic lad and a fantastic player - I don't think there is anybody in the country that heads quite like him at goal. "If it was down to me, nobody would leave. But it's not my money, it's not my football club so obviously anything that comes in we have to take it to the owners."